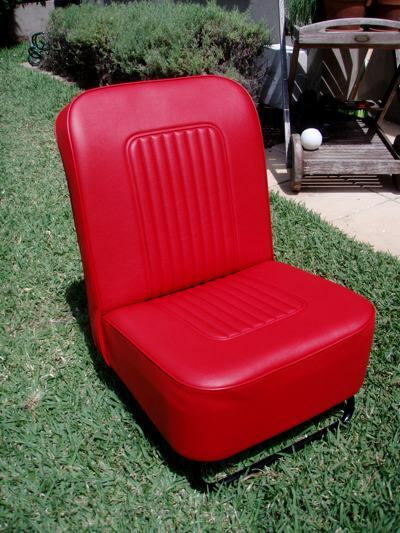 Thoughts on rebuilding a Moggy interior; seats, parcel shelf, interior panels, carpet, mats. Recently I put our Traveller on heritage plates as we have not been using it as much recently and the rego costs have gotten very large (as we all know!) One of the prerequisites for heritage plates is that the car is as near as possible to standard condition. Our car has stock paint, engine, transmission and brakes, but was fitted with Peugeot 205 seats front and rear. To qualify for club rego these had to go, to be replaced with the OEM vinyl low-backed seats. This has turned into more than just a simple seat replacement, as the carpets had seen better days, some of the originally red trim had been replaced with black carpet to match the later seats and the parcel shelf was basically a mess. I stripped the interior, did a little welded repair on the floor and rear seat pan, and then painted the whole thing in red primer and a couple of coats of White Knight anti rust paint. This is the 'no primer required' stuff which I'm sure many of us have used for black and aluminium coloured parts over the years. The good news is, it accepts tinters from Bunnings paint counter, so if you finds someone with a good eye it can be matched to your car (at no extra cost, at least at my local store) this is really useful, and I intend to use it to give the floors and chassis rails a coat from underneath when I get it up on a friend's hoist ASAP. The parcel shelf was very warped after getting wet from a leaky heater some time ago. I could have cut another one, but as it was otherwise OK I thought I'd try to save it first. I sprayed it liberally with water, and then put it on a concrete floor with a piece of flat weighted timber on top of it and let it dry. Hey presto, nice and flat! My car originally had the Cherokee Red interior, which is a much more bright and jaunty (tasteless?) colour than the mooted maroon of the earlier cars. Unfortunately much of the trim had faded sadly in the sun. Some bits I could recover with new vinyl which I bought from the carpet supplier I used for a very reasonable price (about $30 for 1.5m2), but some of the specially shaped sections would not be easily fabricated by someone as hopeless with a sewing machine as me. A bit of research led me to vinyl paint. I know, I know, can't be any good, right? Wrong... Amazed me, it comes out of the can straight on to the faded (cleaned) vinyl, and restores the colour. Doesn't flake when the vinyl is stretched or folded, no spray marks and doesn't seem to scratch off either! I know it is early days yet, as the parts have not seen any use, but at the moment I'm very impressed. Details below of the paint I used, about $40 a tin, but I have found a VHT product which is probably the same and about half that price. Highly recommended. Any ideas how much carpet is needed to cut a set for a sedan/traveller? Neither did I. The carpet comes in 1.8m widths where I got it from, and I bought a 2m length, just short of $100. Just enough and I mean JUST. There is about enough left over to make a doormat (if you sewed all the bits together). The carpet is top quality and rubber backed so it doesn't fray when cut. I have cut all the pieces (using my originals as a template) but not edged them yet. For edging I intend to have them over locked (like they do on the edges of mats around the home) rather than have a strip of vinyl sewn to the edge. I think over locking looks a whole lot nicer when done in a matching thread, and only costs $6/m at my local specialist in Brookvale (details below). Note on cutting carpet – mark them on the back using chalk or similar. I marked mine on the front using a water based marker, but the pile of the carpet makes it difficult to get the tracing correct as the template tends to move on it without you noticing, and I cut the passenger carpet about 1cm too narrow! Aw! 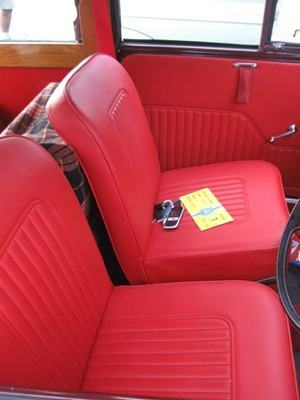 The seats – I was really concerned about getting this right for a couple of reasons – I didn't have any stock Morris seats in Australia being the main one. Thanks to Peter and Les I do now have 2 front seats, and the original rear bench seat for the Traveller is in the UK in my parent's shed – another problem to solve later! I asked them to send out my original seat covers for the front so I could rebuild them on to my old frames, and lo and behold the postman delivered a new set of front covers!! Lucky me! When stripping the seats I took careful note of how they went together. I already had new Pirelli straps, and bought a sheet of 6 mm foam and 0.5m of 'cotton wool' wadding from Clarke Rubber ($25). I wasn't sure about reusing the original seat foam, but it went really well and is surprisingly comfortable on the first (driver's) seat. 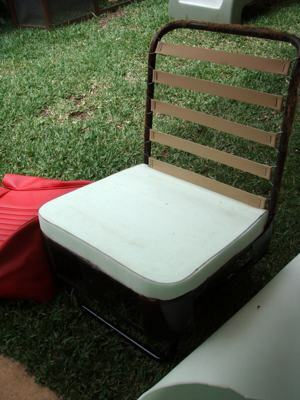 Not so for the passenger seat – the latex base had had it and the horsehair back was all over the place. I replaced both of the pieces with foam from The Foam Booth on Chatswood (Total $22). The base uses a 50mm thick foam – just take in your latex and have it cut around (oo-er sounds dodgy), and the upright bit as about 480x500mm, and the 38mm foam gives it a slightly 'overstuffed' look which is nice and comfy. Use the high density foam for the base and medium density for the back, I used high density for both as he had run out of the medium and it does make the back quite firm (probably good if you have a bad back though). I stuck the upright part to the frame oversized, and then cut it down to size using a bread knife. Seat Assembly Tip – put a couple of layers of the cotton wool stuff on the edges of the seat squab (back) and cover the squab in a thick plastic bag before sliding the cover on. The bag makes it MUCH easier to slide the cover over the frame, and the extra padding makes the seat take a nice shape over the curves. You need about 250 ml of contact glue to rebuild 2 seats. As I write this I'm in the reassembly process for the interior. It's not finished and it's not concours, but it looks good so far, and I did it all myself which is nice. Of course if you want the best, go to someone like Glen Waters, the Morris interiors I have seen of his are first class. Or you can replace everything with new from Morris Minor World or Newton Commercial which would look amazing too, but I like my car to have a little bit of a lived-in look, and finances have limited what has been possible. Comments on "Rebuilding the Morris Minor Interior"